Introducing our newest hotel in Singapore, located in the vibrant district of Farrer Park. The evolution of Farrer Park over the years has seen a significant change – from aviation and racecourse heydays to a vibrant commercial community at present. The first plane to fly over Singapore left its mark over the Farrer Road precinct. Pretty fly if you know what we mean. Located right on top of Farrer Park MRT Station, the 300-room hotel is situated amidst a backdrop of the district’s vibrant enclave; where bountiful sights and sounds within this ethnic community thrive. A medley of old and new - the building’s façade and classic silhouette blends tastefully with the surrounding heritage pre-war shop houses. More than just a place to stay, the hotel also offers a diverse selection of dining options complemented by a club lounge, swimming pool and gym facilities. Park Hotel Farrer Park is the gateway to the neighbourhood’s quaint alley ways and ethnic charms, ensuring each stay has its own story to tell. 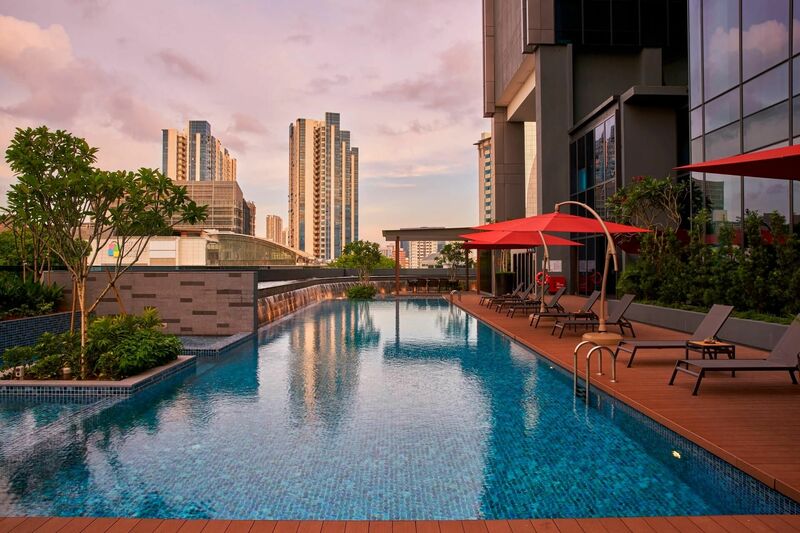 Farrer Park’s best-kept secret, the pool terrace is an outdoor oasis on the hotel’s 5th floor with unobstructed views of the city. This convival spot provides an urban laidback feel whilst you sip on a refreshing drinks and lounge by the pool deck. Or work up a sweat at any hour of the day at our 24-hour Fitness Centre. Park Hotel Farrer Park joins the ranks of Muslim-friendly hotels, having met the requirements of Salam Standard Hotel Classification. The hotel offers a praying mat and no alcohol in the mini upon request as well as it features a restaurant that is halal certified and serves strictly halal food. It also carries a Qibla direction in each room. Blue Jasmine has been recognised as one of Singapore's Top Restaurant 2018 2019 by Wine & Dine Magazine. Blue Jasmine is thrilled to announce it’s all new mouth-watering a la carte menu featuring on 1 October 2018; bringing guests on a gastronomic journey through Thailand, engaging all senses, sight, smell, taste and thought with dishes that represent the perfect balance and harmony in flavours. Save up to 18% on at least 14 days advance booking. Enjoy our special online rates and book direct with us to enjoy the following benefits. Book Direct Benefits Best Rate Guarantee Exclusive Rates Free Wi-Fi Dining Credits Priority Room Upgrade Pre-arrival Requests "Stay Flex" Policy Click here to find out more on facilities & services. 18% off with breakfast for at least 5 night stay with us. Enjoy complimentary Wi-Fi plus attractive F&B and laundry discounts included to make your extended stay an enjoyable one. Book direct with us and enjoy the following benefits. Book Direct Benefits Best Rate Guarantee Exclusive Rates Free Wi-Fi Dining Credits Priority Room Upgrade Pre-arrival Requests "Stay Flex" Policy Click here to find out more on facilities & services. You deserve a relaxing weekend with a complimentary room upgrade and to wake up to a sumptuous spread at our buffet breakfast. Relax and recharge at Park Hotel Farrer Park and treat yourself to the following. Complimentary upgrade from our Superior to Deluxe Room Daily buffet breakfast for 2 guests at Blue Jasmine Afternoon Tea for 2 guests at The Coffee Belt (a complimentary cup of tea or coffee and a choice of pastry) Complimentary late check-out till 2pm (subject to availability) Too good to be missed! Book directly with us for your much needed getaway and be rewarded with 7 Exclusive Benefits. Travelling with family? Click here to find our more about our family-friendly amenities and services. At Park Hotel Farrer Park, its all about redefining classic comforts. Artfully crafted 300 guest rooms and lofts boasts modern comforts that overlook Singapore’s iconic skyline which are located from floor 9 to 20. A fine showcase of substance and style, the 5 room categories choices ensure collective fun for business and family travellers alike, and are tailored to suit each individual’s needs.